Bullying used to be depicted as kids being shoved into lockers and coerced out of their lunch money by the older, more popular rulers of the school. Nowadays, the focus on bullying has shifted to those hiding behind computer screens and taunting others in the virtual world. While in-school bullying is on the rise, technology and social media have created alternate avenues for bullies to wreak havoc. Whether bullying is done on school grounds or over the phone, the consequences can be lifelong and even life-ending. So how many kids are experiencing cyberbullying and how do their parents feel about it? To get a better idea of technology’s role in bullying, we surveyed more than 1,000 parents of children over the age of five and asked about their children’s cyberbullying experiences. Continue reading to see what we learned. High school students were bullied the most of any age group, according to their parents. Almost 60 percent of parents with children aged 14 to 18 reported them being bullied, but middle school-age children weren’t far behind. Fifty-six percent of parents with children aged 11 to 13 also reported their kids experienced bullying. Nearly 83 percent of parents said the bullying happened at school, and 32 percent said it happened on the bus. 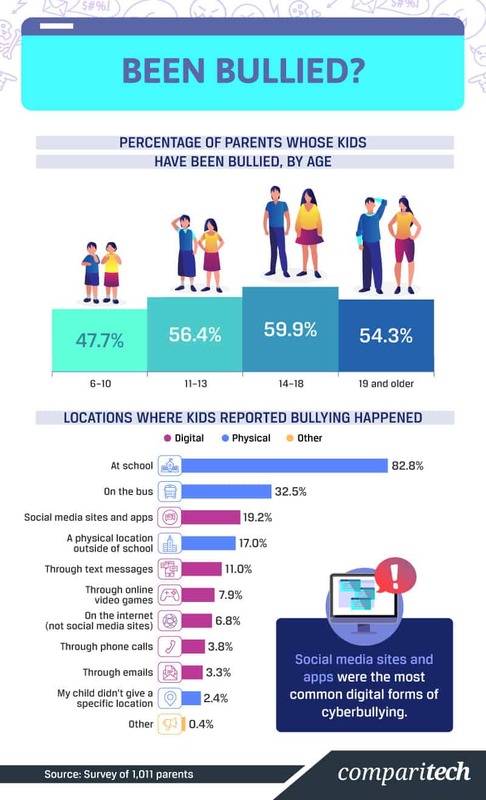 While the majority of bullying occurred in physical locations, bullying on digital platforms occurred in a wider variety of outlets. Nineteen percent of bullying was through social media, and 11 percent was through text messages. Online video games, internet sites other than social media, phone calls, and emails were also susceptible to bullying. The scary part of the digital world is that a person doesn’t even need to have an account on social media to be a victim of cyberbullying. The spread of private information and harmful words on social media sites can be saved and spread in the “real world,” eventually making it back to the victims. Cyberbullying can make it difficult for parents to intervene or protect their children from becoming digital victims. Around 59 percent of parents who reported their children being cyberbullied decided to talk to them about how to safely navigate the digital world. Forty-three percent of parents also adjusted the controls on their children’s accounts and blocked the offender. As many social media platforms have received backlash for their failure to act on cyberbullying, it seems it is up to the parents to block or censor their kids’ feeds to minimize bullies’ ability to reach them. Unfortunately, the issue of failure to intervene is also directed at schools. While schools have some authority over what occurs on school grounds, cyberbullying can take place anywhere and usually occurs off campus. Multiple states have laws allowing schools to punish students involved in cyberbullying, but free speech issues can make it difficult to hold students accountable for off-campus acts. The pushback doesn’t sit well with the majority of parents, though. Almost 66 percent of parents thought schools should hold kids accountable for off-campus cyberbullying – and their desires are supported by research. Studies have shown that cyberbullying is usually not completely off campus, with social media and internet harassment often being an indicator of in-school bullying. Even if the school doesn’t do anything to intervene, 35 percent of parents said they notified the school about a cyberbullying incident. With social media playing such a large role in cyberbullying, which platforms put kids most at risk? 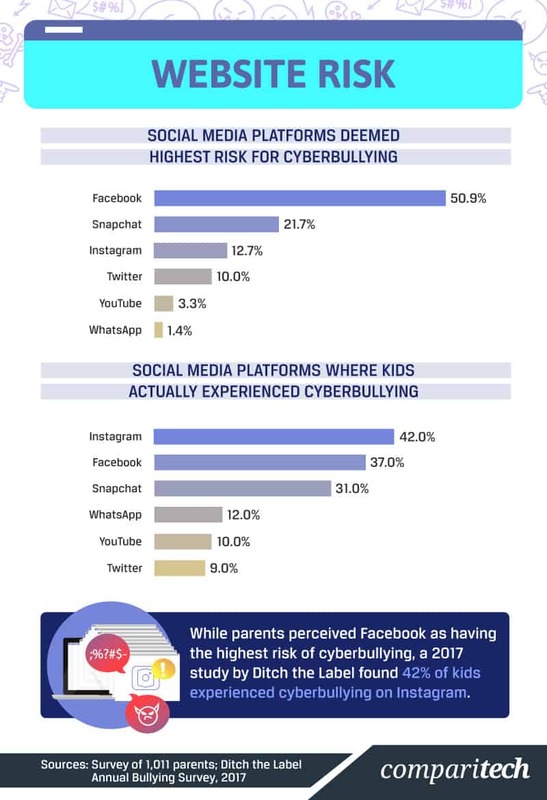 Parents were most concerned about Facebook: 51 percent thought the social media network posed the biggest cyberbullying threat. However, recent studies have shown Instagram is taking over in both the number of teen users and the risk of cyberbullying. Less than 13 percent of parents had concerns about Instagram, but a 2017 study by Ditch the Label found more than 2 in 5 people aged 12 to 20 experienced bullying on the platform. The discrepancy between parental concerns and actual data may be due to parents’ increased presence on Facebook over Instagram. If parents aren’t actively using Instagram, they may be less likely to see the bullying or understand the increased risk. Technology can be both helpful and harmful regarding children’s safety, and development. With numerous pros and cons, there doesn’t seem to be a magic answer for when children should be introduced to technological devices and how much time they should spend on them. However, when children get technology seems to depend on the type of technology. Kids between the ages of six and 10 were more likely to have tablets compared to every other age group and significantly less likely to have smartphones. Smartphones jumped in popularity for kids aged 11 to 13, with 73 percent of parents reporting their middle school-age children having at least one device each. While the average age at which kids got their first personal tech device was 9.8 years old, studies have shown cyberbullying is linked to the amount of time spent on social media rather than the age at which kids begin using technology. The more time children spend on social media, the higher their risk for cyberbullying. Parents reported their children spent an average of 1.8 hours a day on their personal devices. For the majority of children 18 and younger, parents had access to their devices. 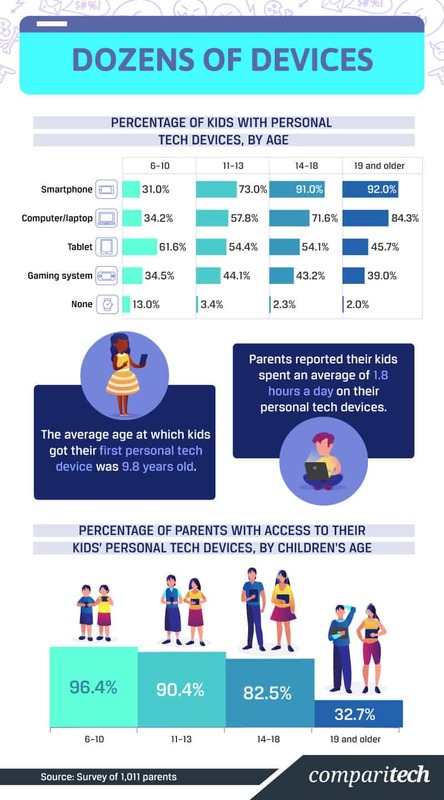 Ninety-six percent of parents with children aged six to 10 had access to their kids’ devices, a number that only dropped to over 82 percent for children aged 14 to 18. Significantly fewer parents with children aged 19 and older said they had access – almost a third, despite their kids being legal adults. Having access to kids’ devices or limiting their screen time is less about overprotectiveness and more about helping children navigate the harm technology can bring. Even the leader of the technology world, Bill Gates, sets strict rules for his children regarding smartphone use, ultimately banning them until age 14. Kids may be getting their own technology at a young age, but when are they creating their own social media accounts? According to parents, around 58 percent of children between the ages of 11 and 13 already had their own social media profiles. Surprisingly, so did 22 percent of kids aged 6 to 10. 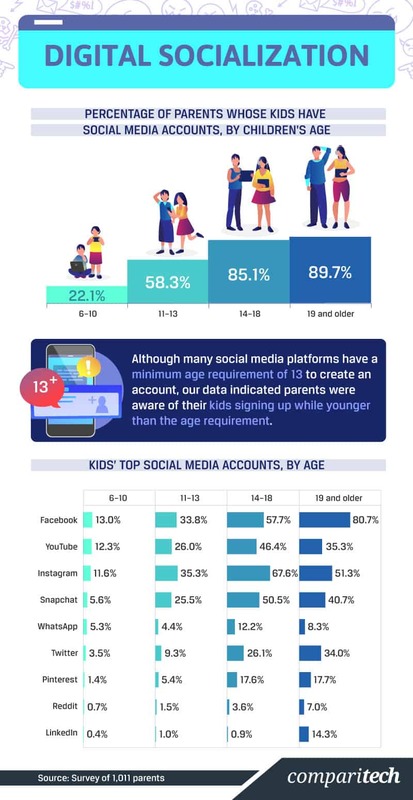 The top platforms for the youngest age group were Facebook and YouTube. The latter makes sense considering the increasing popularity of children’s video channels on YouTube. However, a significant portion of parents with kids from all age groups reported their children had Instagram accounts. Remember, Instagram is now considered a playground for cyberbullying, and despite the minimum age requirement of 13 to create an account, over 11 percent of parents with children aged 6 to 10 reported their youngsters used the platform. Of course, every parent is different, and some children may be more prepared for the digital world than others, but here are some tips to consider before allowing your child onto social media. Looking at the amount of time kids spend on social media may not seem like a lot when broken down by day. 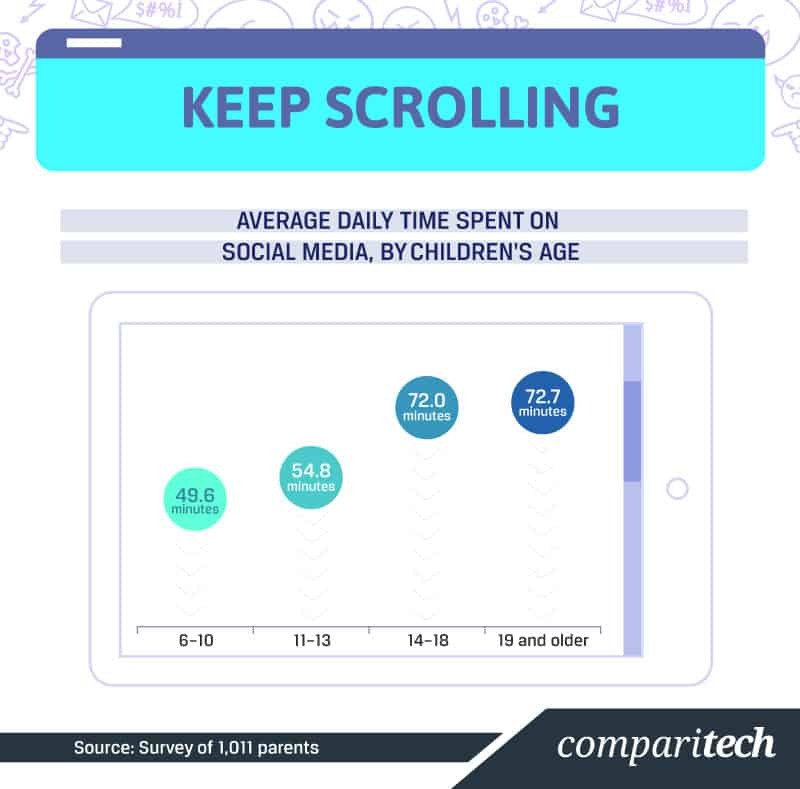 Children aged 6 to 10 spent an average of 50 minutes a day on social media, while those aged 19 and older spent an average of 72.7 minutes online. With most movies being over 70 minutes, the amount of time all age groups spend scrolling doesn’t seem like much. But when we take daily averages and extend them over a year, the numbers sound a lot more serious. Over a year, kids aged 6 to 10 spend an average of over 18,000 minutes on social media – that’s enough time to read the “Harry Potter” series nearly five times. Social media isn’t all bad, but limiting the amount of time kids spend on it each day can broaden their horizons to other activities and decrease their risk of being bullied. Bullying is still ever-present on school grounds and is increasingly problematic online, especially on social media. Kids may get access to technology and sign up for social media at younger ages (sometimes even before the minimum age requirement), but our study revealed that parents are continuing to monitor their children’s use. From limiting their time to having access to their accounts, parents seem to be aware of the threats that technology and the internet possess and are working to protect their children as much as they can. Parents shouldn’t depend on social media companies to step in and police themselves. As an alternative, parental monitoring software can help parents keep track of what their kids do on their phones and manage their activity accordingly. Some tools parental control tools may be included with your device, and a range of third-party vendors offer easy-to-use dashboards from which parents can filter content. Comparitech has detailed reviews and tutorials on the best parental control apps and software. We surveyed 1,011 people. To qualify for the survey, people had to report having at least one child over the age of 5. If they had more than one child, respondents were asked to answer the survey based on their experiences with their oldest child. Respondents were 59.3 percent women and 40.7 percent men. The average age was 42.1 with a standard deviation of 11. Parts of this project include calculated averages. These were computed to account for outliers. This was done by finding the initial average and the standard deviation. The standard deviation was multiplied by three and added to the initial average. Any data point above this sum was excluded from the calculation of the final average. When asked which social media accounts their children had, respondents were given the choices that appear in the final visualization, as well as the options of Tumblr, “I don’t know what accounts my child has,” and “Other.” These were excluded from the final visual due to low sample sizes. In the visual about which social media platforms posed the biggest risk for cyberbullying, Reddit and “Other” were also choices given to respondents, but they were excluded from our final visualization of the data. Respondents answered the survey based on their experiences with their oldest children. It’s possible that respondents with multiple children had different or more acute experiences with their other children. Also, this survey is based on parents’ perspectives. Therefore, they may not have knowledge of all their children’s internet activities. Cyberbullying, like all bullying, is a serious issue that needs to be addressed by parents, kids, school administrators, and communities. Feel free to share this study and start a conversation about what is and isn’t acceptable when interacting through devices and on the internet. Any sharing should be done for noncommercial reuse.